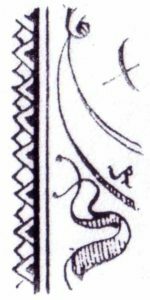 In the third number of “The Record of the Philatelic Students’ Fellowship” I described the general design of the stamps of this issue, I now propose to deal with the secret marks which appear on all genuine stamps and which are not necessary portions of the design. 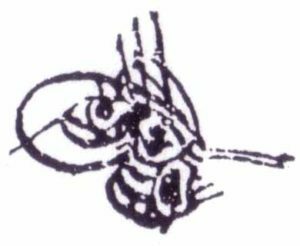 These marks play an important part in deciding the genuineness of specimens, for many of the forgeries in other respects closely follow the originals, as will be seen from the descriptions which follow this note. 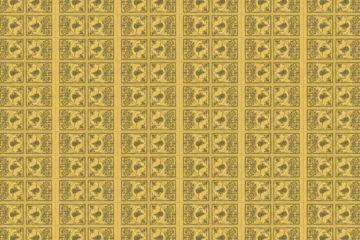 20 PARAS: Black on shades of yellow. Plate 23, Figure A. 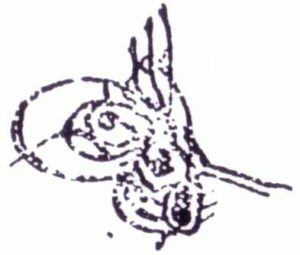 This value was described as having a frame composed of two lines, the outer one having a series of alternate long and short lines projecting from it at right angles, the corners of the frame being completed by squares. 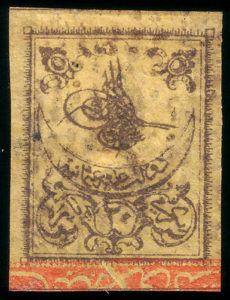 In this case the secret mark takes the form of lengthening of the eleventh short line (numbering from the right-hand top corner along the top of the stamp), so that it passes across the outer line and continues until it joins the inner line of the frame. 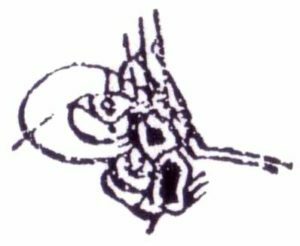 This is shown on the enlarged diagram on Plate 20. 1 PIASTRE: Black on shades of slate. 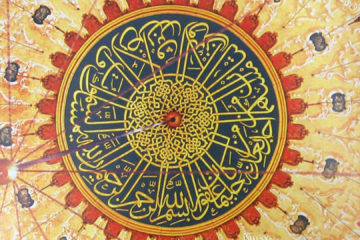 Plate 23, Figure B. 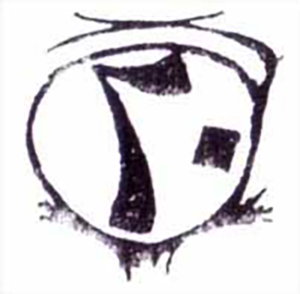 In this instance the secret mark takes the form of a pearl, or Arabic numeral five. 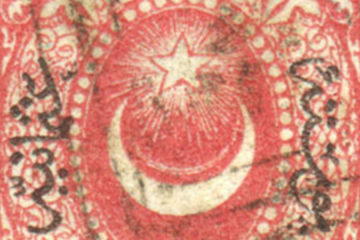 In the center of the stamp, on the shield shape above the oval containing the value, and situated just below the crescent is found a series of thirteen lines extending the upwards from the oval, forming an inverted fringe. 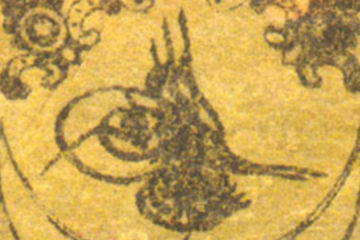 It will be noticed that the sixth, seventh and eighth lines (numbering from the left) have been partly obliterated by this pearl mark, as can be clearly seen on the enlarged diagram on Plate 20. 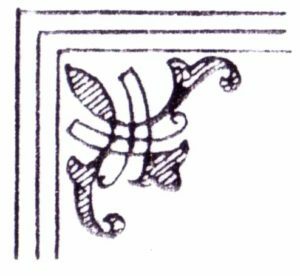 It might be here noted that a dot which could be termed a secret mark appears between inner line and the center line of the frame, opposite the second arc of the corner design, on the top left-hand side 25 mm from the top of inner line, as shown on diagram on Plate 25. 2 PIASTRES: Black on shades of blue. 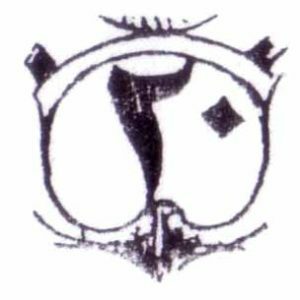 Plate 24, Figure C.
The secret mark which here appears immediately above the circular scroll containing the value, takes the form of a pearl in outline, and is flanked on either side by the shading lines which surround the scroll. 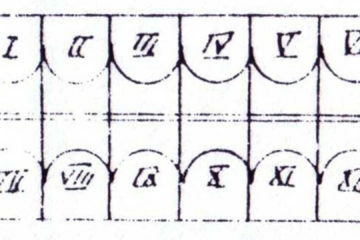 See the diagram on Plate 20. 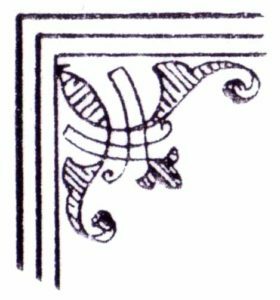 It should be noted that this mark is similar to the one which appears on the one piaster and situated in the same position. 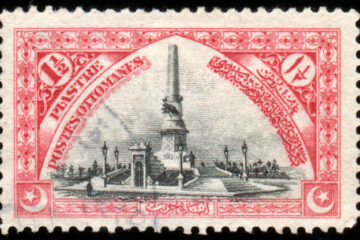 5 PIASTRES: Black on shades of rose. 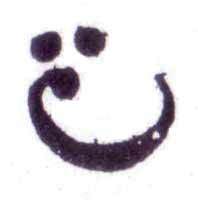 Plate 24, Figure D.
The secret mark takes the form of a dot found between the two lines which form part of the border. 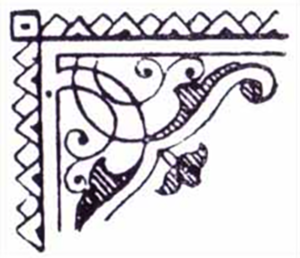 Its exact position is immediately to the left of the left-hand top corner ornament (inside the frame), opposite the junction of the inner line of border and second line (from the top) of the corner design. This is made clear on the diagram on Plate 20. 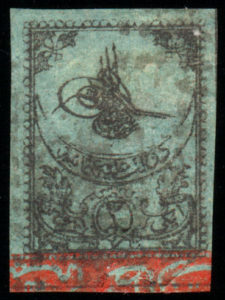 It might not be out of place to point out here that the name Reversed Toughra is in fact, a misnomer, for, as will be seen from the illustration on Plate 20, the whole of the design is reversed, with the exception of the control band, which is printed separately from the rest of the stamp. 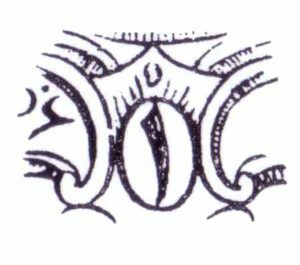 The secret mark in this illustration is clearly shown in the reversed position, there are numerous other marks that might be termed secret, but, in my opinion those described being constant in all genuine stamps, and yet forming no part of the general design, may be, in truth, designated secret marks. 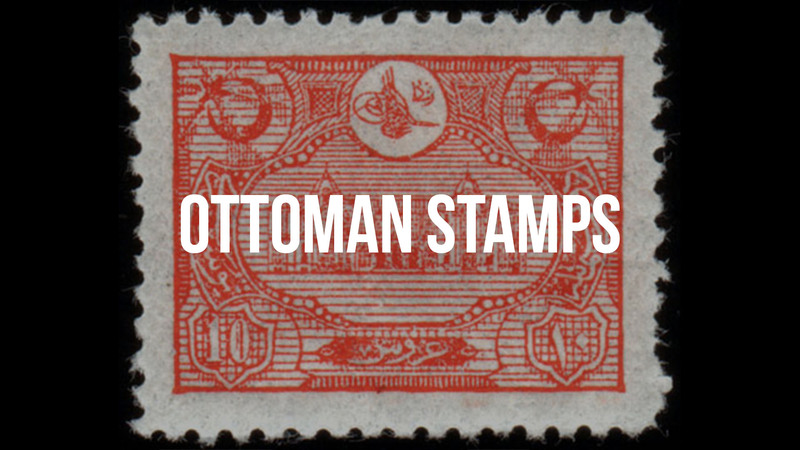 The first issue of Turkey has been forged to some extent, despite the fact that both the method of production and the design were very intricate. The paper employed was of an extreme flimsy nature, which accounts for their scarcity at the present time. 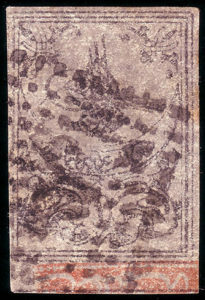 These forgeries are, as a rule, found lithographed in black on pelure paper, both thin and medium in weight, and of a somewhat clean and hard surface. This paper appears to have had the color required added to the pulp before making, and it has in no way impaired the translucent quality. 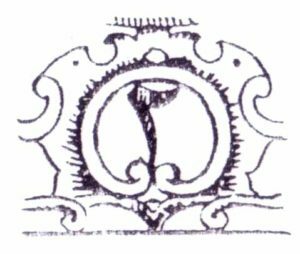 I might here mention that in appearance the paper closely resembles that of the ten and thirty silber groschcen, 1866 issue of Prussia, which leads me to think that the forgeries with which we are dealing appeared between 1866-70, and were of German origin. 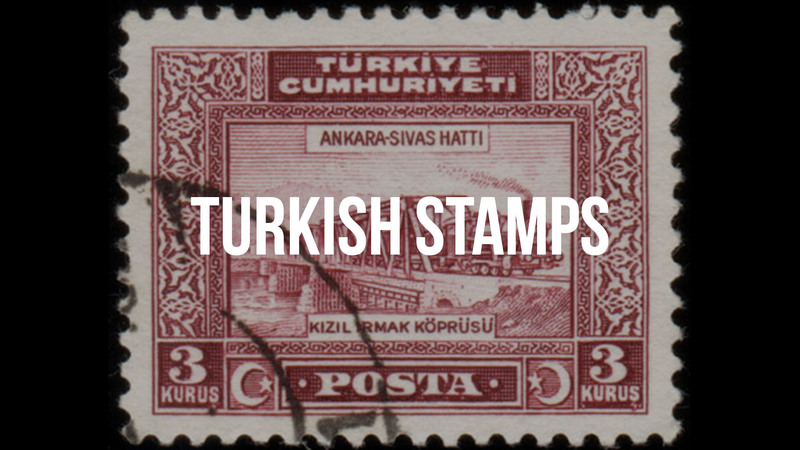 The gum used was of two kinds, one colorless, and the other of a light yellowish tint, and was applied after the stamps had been lithographed, and in some cases after the forged postmark had been applied. This operation could not have been simple, judging from the substance of the paper, and this no doubt accounts for the forgeries which are found gummed on the face, and sometimes on both sides. 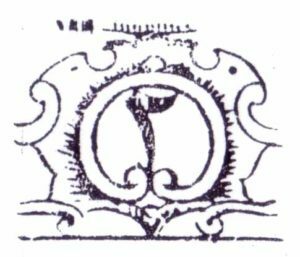 The forged productions, as a whole, cannot be described otherwise than as good, for in obtaining the general appearance the counterfeiter has been very successful, and the general collector has need to be very careful that he does not buy one of these productions. 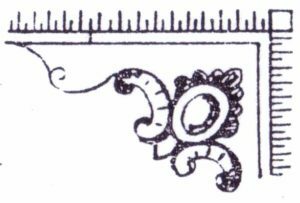 How closely these resemble the originals may be seen by comparing the illustrations of forgeries on Plates 21 and 22 with those of the originals on Plates 23 and 24. 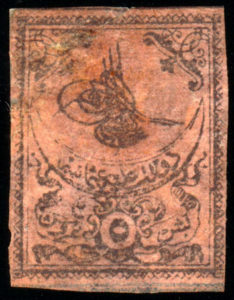 The stamps as mentioned above were lithographed, but I am unable to say how many went to form the sheet although that they were not printed foot to foot, as in the common printing of the originals, is apparent from copies in my collection. The impressions were so placed on the sheet that there was a space about 3 mm wide between each at the sides, with one 4 mm to 5 mm at the foot, to contain the control band. 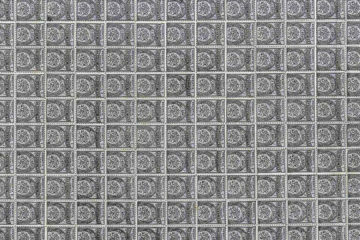 The sheet was divided by vertical and horizontal lines, the vertical ones passing midway between each two impressions, and the horizontal ones about 35 mm from each stamp, thereby leaving space for the control band above, and not dividing it into two, as in the originals. This control band on examination proves, as a rule, to be a poor imitation of the original, but it also brings up an interesting point. 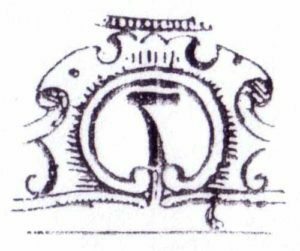 The forger, when he set to work to make his reproductions of these stamps, had apparently only single copies to work from, as on all forgeries that I have examined there has not been one which shows any attempt to give the complete band, which certainly goes to prove the above. Single copies of the original show about as much as has been attempted by the forger. For the sake of clearness I do not propose to describe the designs in details, but to give at the end in tabular form the most important parts of each value. One or two interesting items might be mentioned here applying to all values. 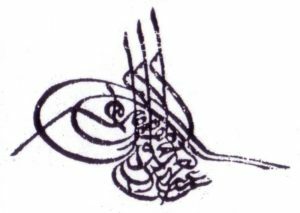 Arabic character Kaf, C or K, a diagram of which here is shown. The other takes the form of an enlargement of the last, with additions. In conclusion, I desire to record my appreciation of the kindness of the following gentlemen: Messers. II. 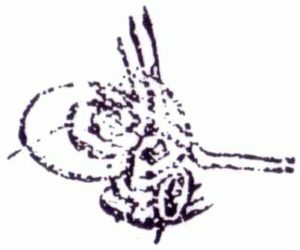 L. Hayman, A.B. Kay, M. Z. Kuttner, Ali Rezi, G. Hamilton Smith, and A. Yarenudji, to whom I am greatly indebted for their assistance.